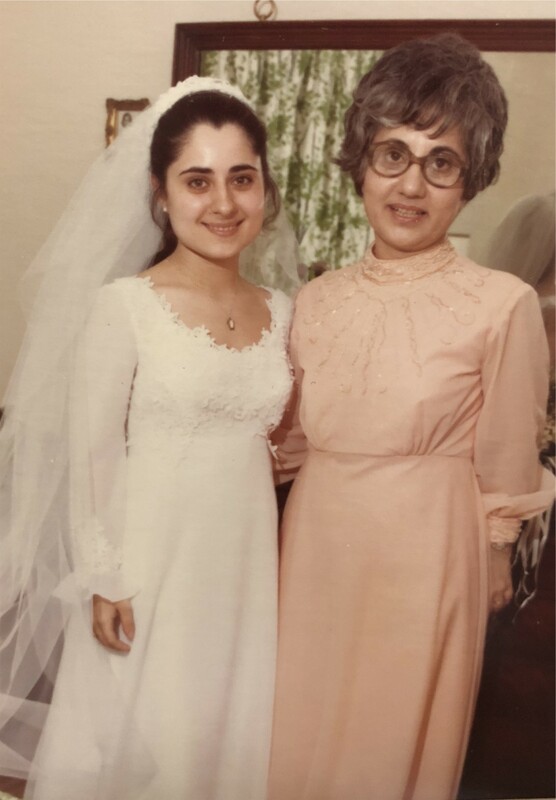 I am so grateful for an opportunity to talk about my Mom’s wedding gown. We were extremely close, and she passed suddenly from a heart attack in 2015. Planning my wedding without her was very emotional, and I tried to incorporate as much of her as I could into the day. My Mom’s name when she got married was Susan Rose Tranchetti (changed to Susan T. Wright upon marriage). She was only 22 when she got married to her high school sweetheart (my Dad). The gown was purchased at Vera Plumb Bridals in Montclair, NJ, which is no longer in business but was very popular in its day. One of the sleeves on her wedding gown was torn where the sleeve meets the shoulder. 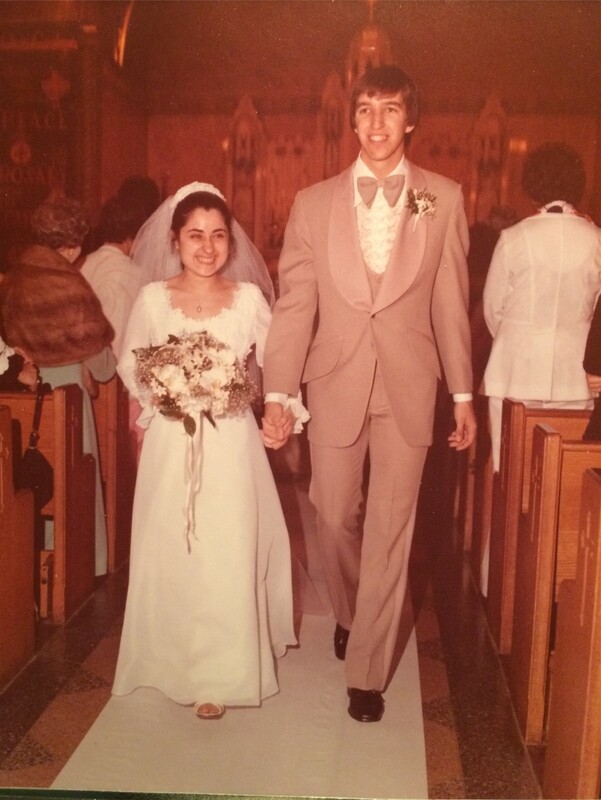 This happened on my parents’ wedding day. 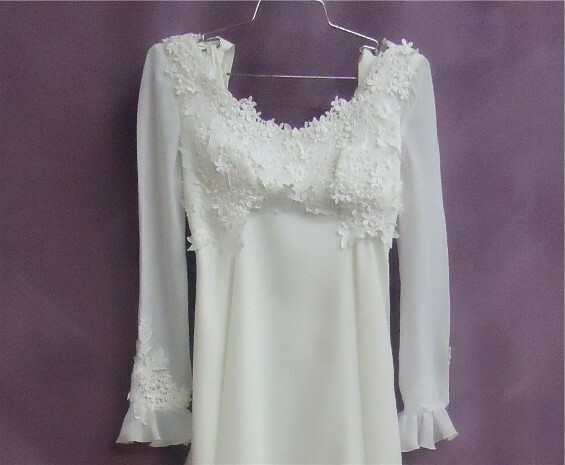 The sleeves needed to be shortened, and since the ends of the sleeves are quite intricate with the lace and cuff, the seamstress decided to remove the sleeves, shorten them from the shoulder end, and sew them back on the dress. This didn’t leave much room for my Mom’s arm! Luckily my Grandma was able to stitch it up on my mother’s wedding day. Meredith’s mother and father on their wedding day. Fast forward to my own engagement, at which time my Mom had passed away roughly a year prior. My Dad and I emptied out the entire attic in an attempt to find my Mom’s gown, and it was the very last box up there. I had totally lost hope that we’d find it, so it was very special when it turned up. I was able to fit in it and liked it very much–especially the lace and neckline, however I had the same issue with the sleeves. Local options for cleaning the gown would have cost as much as a new one (I hadn’t heard of Heritage yet! ), and I didn’t really think I’d have the heart to completely remove the sleeves (which would be necessary for comfortably wearing it). So I opted to find my own gown, but did have the long piece of her veil cleaned at Hallak Cleaners in NYC to use on the wedding day. 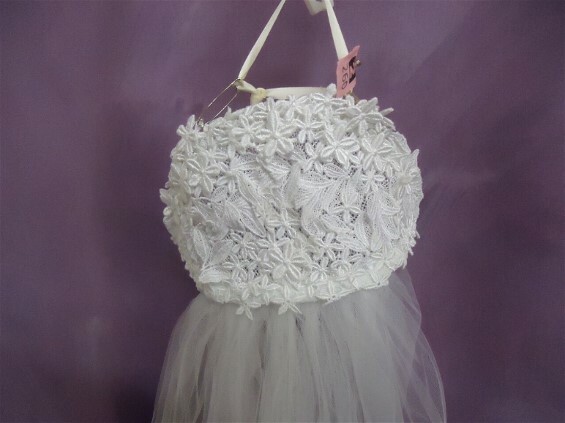 I also cut lace from the sleeve that had torn and fashioned it into a hair comb, which was a fun DIY project. 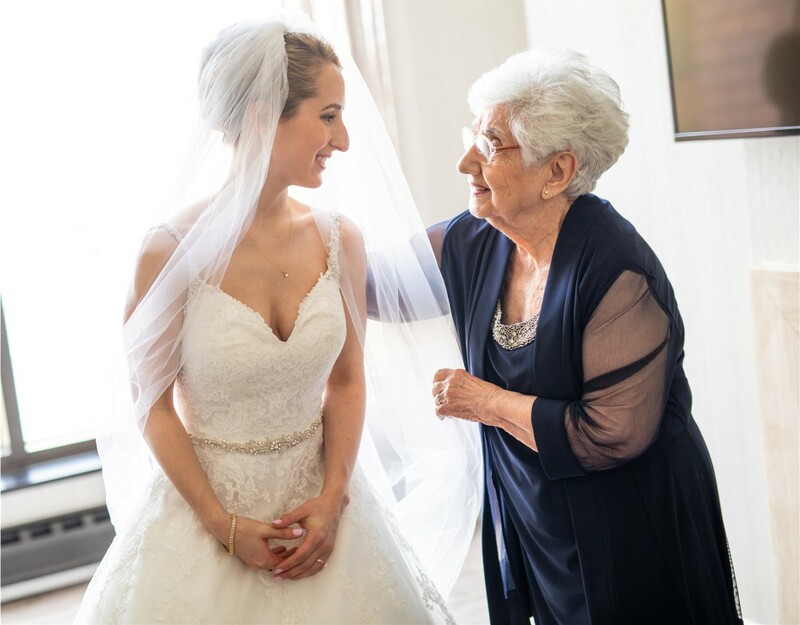 Her simple, classic veil and the lovely lace comb were the perfect ways to tie my Mom’s elegant style into my wedding day outfit. I also wore all jewelry that belonged to her (even my engagement ring is hers). 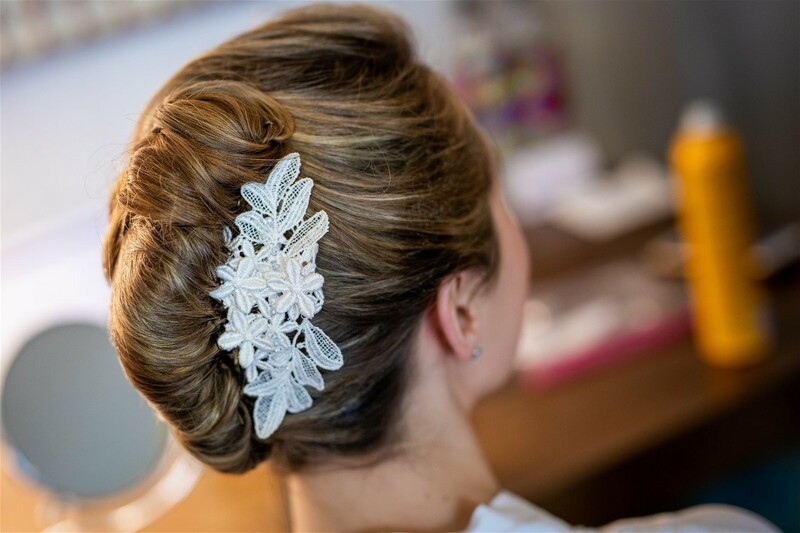 Meredith’s lace hairpiece was cut from mother’s wedding dress lace. Meredith and grandmother on her wedding day. Meredith’s vintage wedding dress with lace appliques had moderately aged with yellowing and large oxidation stains throughout the dress when we received it. Lace appliques were missing from the sleeves and in the front of the chest. The veil headpiece had significantly yellowed with age. We removed the buttons on the vintage gown before treatment and replaced them afterward to prevent rusting. 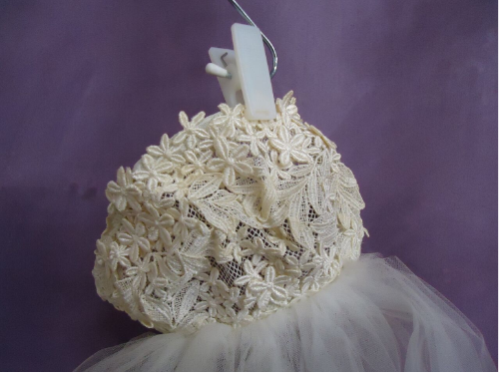 We gave the gown and headpiece a hot chemical treatment to whiten color and remove oxidized stains. The veil headpiece and gown look beautiful again. 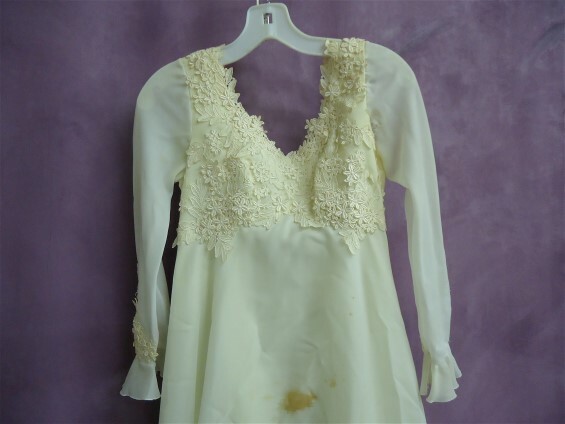 Do you have a vintage wedding gown that has yellowed? Get a Free Quote for Wedding Dress Restoration and let HGP work it’s magic on your treasured heirloom. What a lovely story by all of you. What a beautiful family they created with so much love. I wish they would have written a book on how to parent!